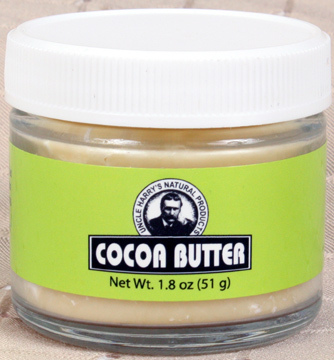 Uncle Harry's Cocoa Butter, 1.8 oz / 51g (Uncle Harry's) - Penn Herb Co. Ltd. This light creamy moisturizer is perfect for all skin types. Use it for dry, chapped skin anywhere on the body, and to soothe sunburn and minor skin irritations. 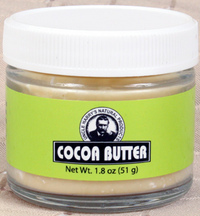 NOTE: Cocoa butter is a wax obtained from the roasted Cacao bean by expeller-pressing. It is solid at room temperature. It has a light creamy consistency. It has emollient qualities and absorbs quickly into the skin's surface. (An emollient smoothes & softens skin).